Chesterfield goalkeeper Tommy Lee believes the squad are unequivocal in their support for under-fire manager Gary Caldwell. The Spireites have won just once in eight outings this season and fell to a 5-1 drubbing at Crewe on Saturday. Speaking ahead of tonight’s trip to Colchester, Lee said the players have let Caldwell down of late. “The lads are down, we under performed and it wasn’t good enough,” he said. “But we’ve got a chance to put it right. “I can only speak from a personal point of view from what I’ve seen the lads are 100 per cent behind the gaffer. 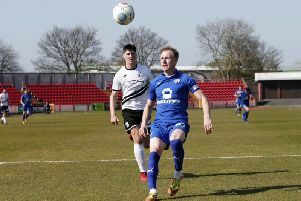 Lee doesn’t attempt to sugar coat Town’s performance away from the Proact this season, with four defeats from four outings. Tonight at Colchester they’ll have a chance to start improving that record and their overall hopes of 2017/18 success. “Our away form has been rubbish this season and we’ve got an opportunity to go there and start a bit of a run,” he said. “In my time at the club we’ve gone to Colchester on a number of occasions and when we’ve needed results we’ve got them. “We’ve got to do that, sooner rather than later. He acknowledges that Colchester, unbeaten in four games at home, will be a tough proposition but says Chesterfield should be earning points from games like this one. “They’re enthusiastic, have some good players, they work hard,” he said. “It’s going to be difficult but with the players we have under performing, if we start performing we’re going to pick up results.